It’s the subscription for guitar players! Here you can choose your string preferences, and subscription term. String Brand Choose an optionDunlopErnie BallD'AddarioSurprise Me! Guitar Crate sends out strings and other gear that will help you get the most out of playing your guitar. Every month is a mystery so sign up and enjoy! Shipping within the USA is included in the price and international shipping is only an additional $10/month! 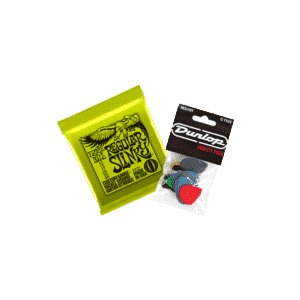 Dunlop, Ernie Ball, D'Addario, Surprise Me!